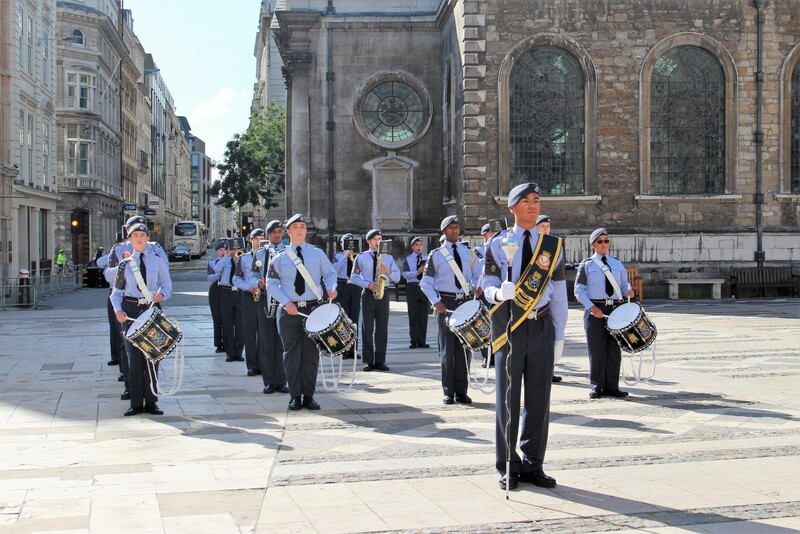 The second of the Lord Mayor of London’s annual Cadet Music competition took place under glorious warm sunshine in the Guildhall Yard on Saturday 29th September. Cadet bands from London’s Royal Air Force Air Cadets and London’s Army Cadets performed before a distinguished audience including a judging panel of the Rt. Hon. 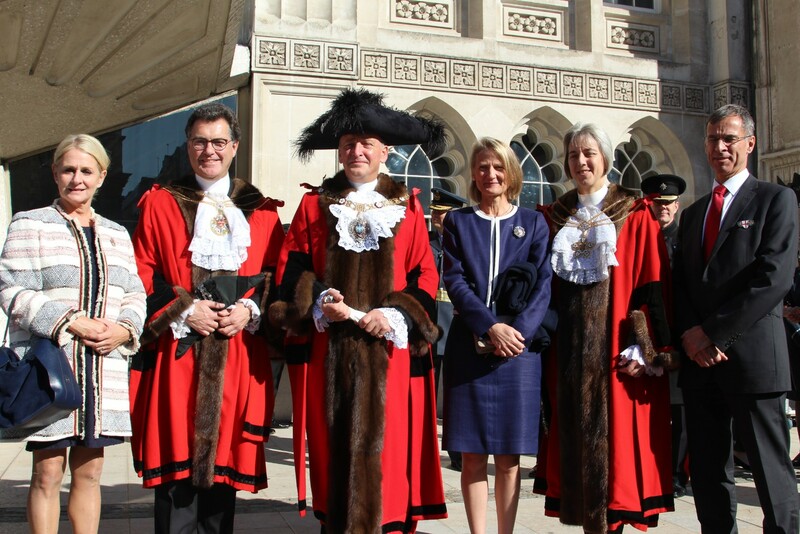 Alderman Charles Bowman (Lord Mayor of London), Sir Andrew Parmley (past Lord Mayor), Maj. Gen Ben Bathurst (General Officer Commanding LONDIST), Air Vice Marshall Dave Cooper (Air Officer Commanding 2 Group), and Lt. Col. Darren Wolfendale (Commanding Officer Household Division Bands). The Army Cadet band led by Drum Major Izidoro marched on and were inspected by the judges. They then played “I vow to thee my country” and “Mud Cabin”. Two individual bugle pieces (Last Post and Sun Set) were played by Cadet Sergeant Hutton and Cadet Sergeant Anciano. The Royal Air Force Air cadet band led by Drum Major Cadet Kovac, then marched on and were also inspected by the judges. They played “I vow to thee my Country” and “The RAF March Past”. Two individual bugle pieces, “Last Post” and “Reveille” were played by Cadet Sgt Connie Willis and Cadet Flight Sergeant Daniel Hill. 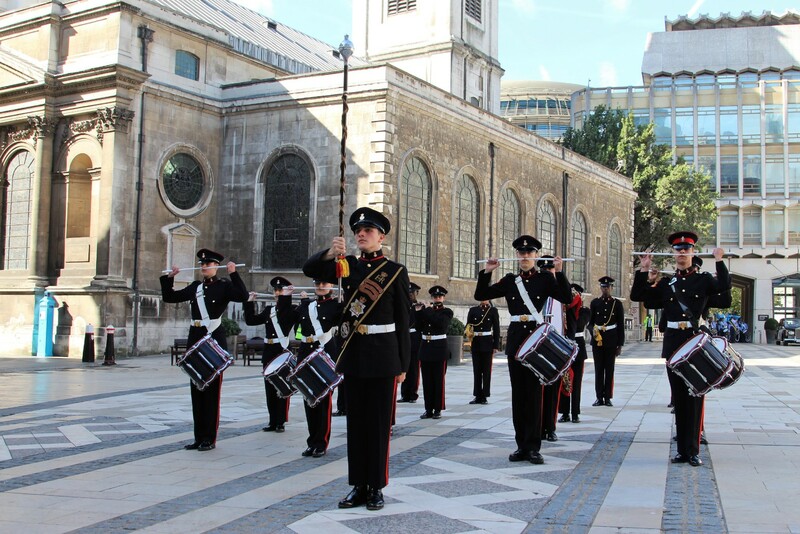 The Band of the Irish guards then gave a fine marching and standing performance of tunes which greatly entertained the audience of civic leaders, military personnel, cadets and families. After a lunch reception in the Crypts of the Guildhall, the Lord Mayor Alderman Charles Bowman announced the winners. RAF Air Cadet Sergeant Connie Willis won the trophy in the bugle playing category for her piece “Last Post”. Overall winners of the competition were the London and South East Region RAF Air Cadets beating the Army Cadets by a narrow margin. Thanking all those who had made the competition possible the Lord Mayor said how impressed he was at the high standard of the teams, and hoped that more would be encouraged to participate in future years.